I have a friend who went to six holiday parties this past weekend. Six. I don’t know how a person even pretends to drink that much wine – I myself spent the weekend with hiking in Big Sur, trying to soak in the last bit of California coastline, sunshine and redwoods before Zack and I move to New York in January. Yup – we’re officially moving back. We just signed the lease on a cute little apartment in Brooklyn and, come the 1st, we’ll be packing all of our belongings again into the six suitcases we’ve ensured they all fit into, we’ll be tricking our cat into stepping into the travel carrier that’s flown her thousands of miles around the world with us. Yes, we’re doing all of this during the middle of a time of year when California is a brilliant ball of outdoor sports and sunshine, and New York is a frigid tundra. Yes, we’re doing all of this during the year that we’re planning a West Coast wedding. Yes, we’re a little bit crazy – but we’re also super excited. New York is one of my favorite cities in the world, and though I’ve lived there before, I’ve never lived in Brooklyn (which I’m even more endeared to after seeing the film of the same name. Have you seen it? I thought it was one of the loveliest cinematic experiences I’ve had in awhile). But I digress. For those of you who spent the weekend indulging – whether it was in alcohol or cookies and cakes – this is the soup for you. I like to make this a few times a month throughout the winter to bolster my immune system against colds and flus, and to protect myself from the inevitable few pounds that tend to creep up this time of year. Because, basically, this soup is a one-bowl wunderkind. You know that green juice that Gwyneth is always toting around, touting the miracle benefits of? This is like that, but way better. 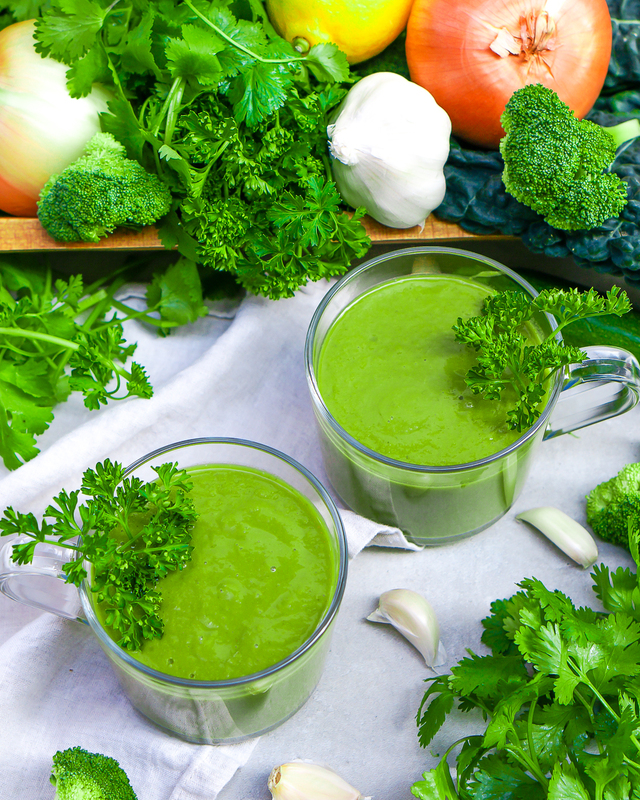 This detox soup has some of the most powerful members of the cruciferous family, kale and broccoli, which increase the amount of glucosinate in your system. You know what glucosinate does? It helps rev up your liver, the organ responsible for processing all those champagne toasts and mulled wines you’re tossing back throughout December. 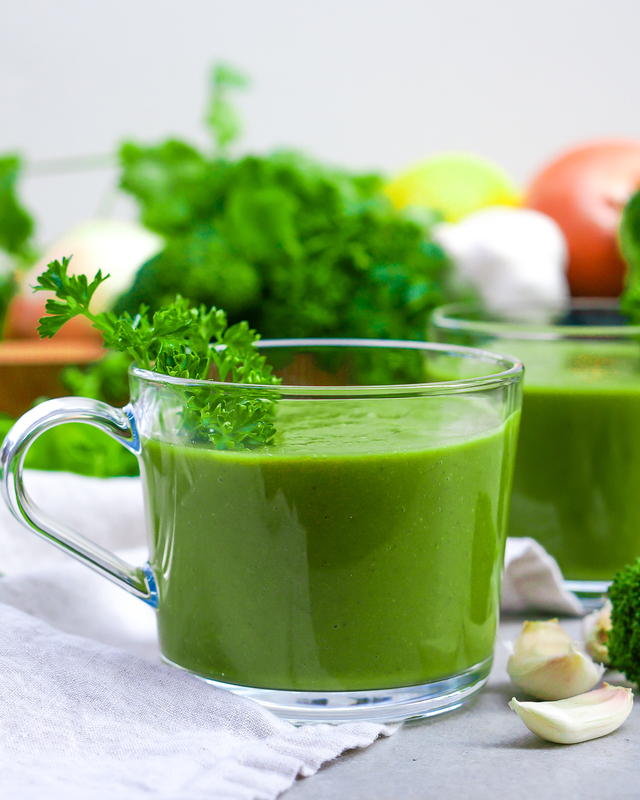 It has cilantro and parsley, both left in their raw form, for an abundance of chlorophyll and digestion-aiding enzymes, in addition to chelating (or blood cleansing) powers. Garlic, left mostly raw, is one of the most powerful immune boosters on the planet, with antibacterial and antiviral properties (translation: that cold going around the office doesn’t stand a chance). Lemons also assist in liver function, and help, along with the copious amount of fiber in the soup, to de bloat and get your digestive tract moving. 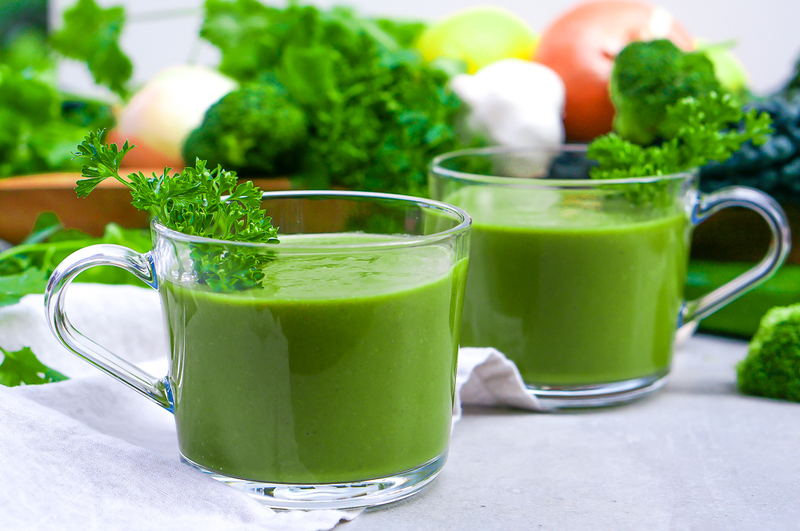 And beyond that: it’s good – far better than the green juices we’re always glugging. The carmelized onions add a bit of savory sweetness, and the overall taste, while definitively fresh, is that of a really good vegetable soup. I serve this all the time at dinner parties to people who are not at all health interested, and they gobble it up. But personally? I like to make a big batch on Sunday night and sip it throughout the week, just to give my system a boost of health. I’ll take it in a Mason jar to snack on when I’m out and about, and sometimes, I’ll even sip it for breakfast – there’s something so nice about knowing you’ve gotten a week’s worth of nutrients in by 9 am. Bookmark this one – it’s one of my absolute favorites to keep coming back to whenever I need a little health boost. In a large pot, heat coconut oil over medium-high until warm. Add onions and cook for 5 minutes, stirring occasionally, then add zucchini, kale and broccoli and cook for 5 additional minutes. Pour in vegetable stock and bring to boil, then reduce heat to low and simmer, covered, for 15-20 minutes or until broccoli is easily pierced with fork. Turn off heat and add garlic, then let cool, uncovered, for 15 minutes. Working in batches if necessary, blend with cilantro, parsley, lemon and sea salt until very smooth. Serves 4. Delicious! I used a tad too much parsley but it’s still good. This will be a weekly meal for sure. After a traveling and enjoying food, drinks and sweets, I made this soup to reset my body. It is delicious!!! I have had a mug each of last two days and it quickly helped with feeling satisfied and reduced cravings for all things I indulged during vacation…planning a grocery run so I can make more. So glad to hear! Hope your vacation was amaze!! This recipe is amazing! The soup tastes so good, it’ll replace my morning green juice. Delicious! Does it freeze well? Yes! It should absolutely freeze well. After looking at various recipes, the reviews for this left me wanting to try it so bad! I decided to make this last night, and for a green detox soup – it tastes amazing. It made approximately 4 portions (I think I tend to make my portions slightly bigger than they’re supposed to) and also made some modifications to the recipe – half a lemon and half a lime I used, used half the amount of garlic (5-6 cloves), and added ginger. I’ll definitely be making this again!! This is tasty! Thank you ? This is amazing- I am allergic to onion and did not have parsley and this was still super tasty. Love the lemon in this recipe. This soup was absolutely fantastic!! Thank you so much for sharing your recipe! Just made this an it’s amazing what’s the calorie count for a bowl of it? I love, love, love this! It doesn’t need any help, but I also add tumeric, avocado, and cayenne. I’ve been making green soups for years and this is THE ABSOLUTE BEST ever!!!! Incredibly delicious with the perfect blend of flavors and full of nutrients. Love!!!! Can’t wait to make this! Do you drink it warm or cold? So good! I put in an entire bunch of parsley, an entire bunch of cilantro and 1/2 a small lime juice. I’ve been eating it all day with walnuts sprinkled on top. Obsessed! I made this soup. It is very tasty. I put in half the garlic and it was still pretty garlicky. I also topped it with a few pinenuts and a couple pieces of goat cheese crumble . This looks great! Do you consume it cold or hot? I love your pineapple/cilantro/arugala smoothie (texture and flavour) and while I could drink it everyday, would love something berry based to change up- anti-inflammatory targeted-can you help?! Made this soup tonight for my parents who aren’t typically concerned about healthy eating, and they loved it! Great taste and very healthy. Can’t wait to make this for my friends! Love it! Mine doesn’t look like yours, it has more of a pesto look/colour. But it tastes so good! I’ve added some spices when cooking and lots of Tabasco after re-heating. I will decrease the parsley next time I make it though. You talked about it being great for winter, I think it’s perfect for summer – so light and refreshing. Thanks for sharing! Tried this soup today. I dont like any of the main ingredients and yet loved this soup!!! I hate broccoli and kale and even after many attempts never found a recipe which could change my taste buds…. Till now! It’s so creamy (how…??) and very filling. Couldn’t give you more than 5 stars, this recipe is 10 star. Thanks a lot! ? I made this right after finishing my 3 day smoothie detox and it was a simply amazing! Looking at the recipe I didn’t think it would have much flavour, but oh I was so wrong. Thank you! ? I wasn’t expecting this soup to be this wonderful I am a foodie and I do know good food. I added a couple chopped carrots to this and used tomato bouillon as my only change. I opted to add the lemon to mine individually and leave the batch without it because it does take the savory away. It is good both ways but I prefer mine savory. This is probably the best green soup recipe I have had, you don’t even know how healthy it is would like to have the calorie content but other than that kudos to you! This soup is so bloody good! 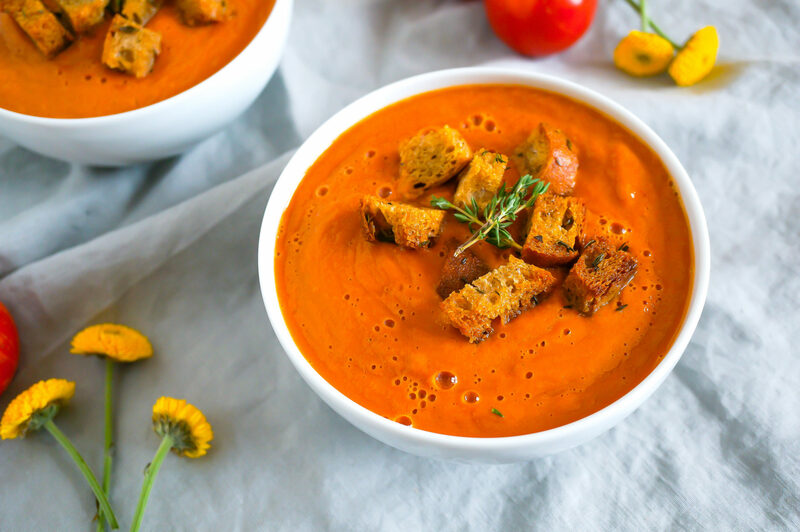 My husband and I decided to do an at-home, weekend detox retreat and are using this soup as part of our meal plan. Super easy to make and absolutely delicious! Tasted very fresh! Already plan to make another batch tomorrow. Can spinach be substituted for the kale? Mine does not look like yours??? I think this is going to be my new favorite soup! 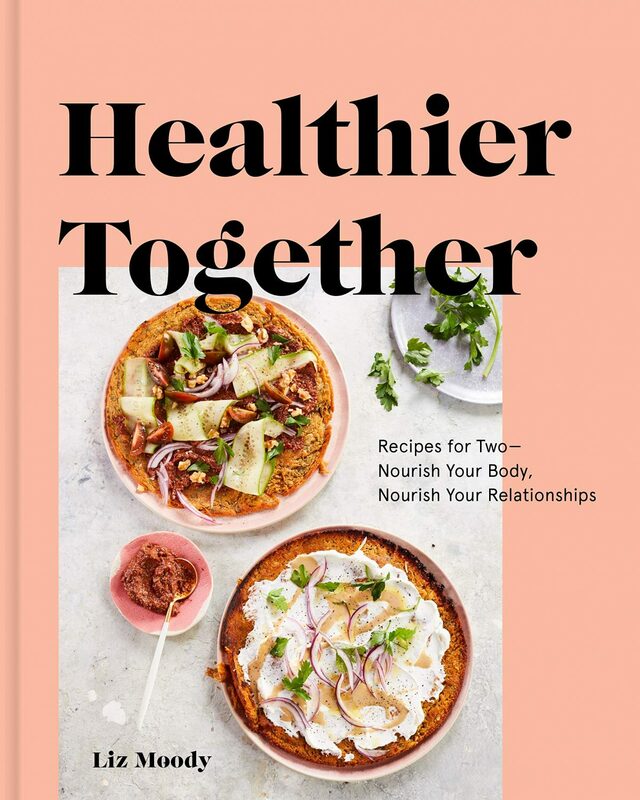 I’m doing a Candida cleanse, and I’m constantly looking for new recipes. This will fit right in! Yay! Good luck with the cleanse! Making this now! 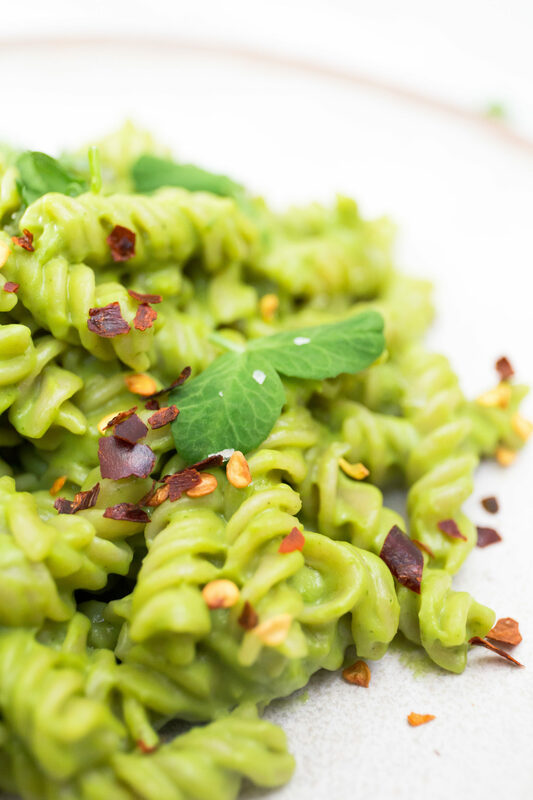 You mentioned the benefit to using the cilantro and parsley raw…will they be affected by reheating the left overs? Hi Carrie! No, it shouldn’t – the heat won’t be on the soup long enough to affect it at all. Enjoy! Do you serve cold like a juice or hot like soup? I love it hot like soup but it’d work as a savory smoothie! 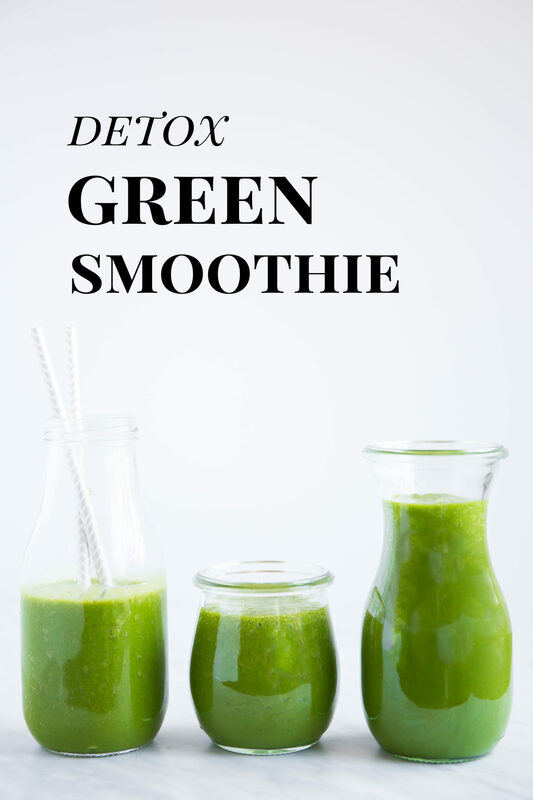 I am not a huge fans of straight juicing or green smoothies, so this detox recipe appealed to me. I made it today and I have to tell you, it is absolutely DELICIOUS! It is warm and hearty with lots of flavor. I can’t speak to the long term benefits yet, but this will definitely be a staple in my home. Thank you for sharing a fantastic alternative to traditional juices and smoothies. Wow thank you Mary Lynn! I’m so glad you liked it! !